Last night, the lovely Shonelle and I went to see the San Francisco Ballet's tribute to Jerome Robbins. Being a big fan of his choreography, I was very excited about the show. The show featured three pieces: Fancy Free, In the Night, and West Side Story Suite, and I'm not gonna lie, I was probably the most excited about West Side Story Suite. West Side Story was one of my first musicals, definitely one of the first that I knew inside and out; I have memories of listening to my original Broadway cast cassette tape (yes, cassette tape) on my Walkman in the car on family trips when I was a little kid. I loved that show then, and I love it now. I think the best way for me to review this show will be to talk about each section separately, so, well, that's what I'm going to do. You can read the program notes here. Fancy Free: Definitely a great way to start out the show. Upbeat, recognizable, great choreography with just enough of a plot to keep you interested. And who doesn't love those three sailors who would later become the sailors in On The Town? [side note: Did you know that the term "fancy free" comes from one of Oberon's speeches in A Midsummer Night's Dream? I didn't, until now. And I'm a Shakespeare nut! And a Broadway nut! Anyway, rad.] The dancers were great, the music was great, it all worked. I'm a big fan of On The Town, and I'm a big fan of Fancy Free. And I love that a ballet was the inspiration for a musical...and that both stand up well on their own. It's such a simple story (three sailors on 24-hour shore leave in NY try to meet girls) that it works well as a one-act ballet, and with the charming lyrics of Comden & Green, it works well as a full-length musical (and, um, movie musical with some of the best performers of the time). I think it's safe to say that Fancy Free is a classic. And while nothing will compare in my mind to ABT's version, the SF Ballet did it justice. In the Night: This piece really impressed me. I had no idea what to expect - I had heard it was romantic, and that's about it - and it was truly spectacular. First of all, the music was Chopin. I'll admit, I'm not terribly knowledgeable in the canon of Copin's work, but his nocturnes are just beautiful! The dancing was perfectly suited to the solo piano, and honestly, I found myself gasping or whispering "oooh" and "wow" to myself several times. It was just so beautiful. I'm glad I read the program notes before seeing it, too, because they explained the structure of the piece, and I think that helped me to appreciate it even more. The basic structure is this: there are three couples (dressed in "evening wear"), and four movements. The first couple/movement represents young love: the couple is all over each other, happy, careless, in love. The second couple/movement represents a more mature love: the couple seems to communicate without words (or touching/visual communication, since this is dance), and they seem to have a deep connection that has lasted over the years. The third couple/movement represents a fiery love: passionate, vitriolic, angry at times; they run away from each other, but always return. The fourth movement incorporates all three couples as they interact mildly as if they were greeting each other after a dinner party. It is apparent that they recognize something in each other, but their interactions are somewhat stifled. I have just realized that I am NOT doing this ballet justice in my review. I'm sort of babbling about how it was structured and am not at all capturing how absolutely lovely it was and how much of an effect it had on me. Easily, this is one of the favorite ballet experiences of my life. Highly, Highly Recommended. Ah, now for the West Side Story Suite. It's always easier for me to write criticism than praise after a show, so this should be a breeze. There was just so much about it that didn't work for me, so let's start with a basic rundown of what it is, for those of you not unfortunate enough to witness it. West Side Story Suite is basically an abridged version of West Side Story, originally created to bring younger audiences to the theatre. It features highlights from the show, sort of bridged together with singing (more on that later), but not really in a fluid way. Scenes/dances end with a pose that often feels like a photo-op, the lights fade, and the next section begins. Much of the story is lost, because honestly, you can't capture West Side Story in a 35 minute dance-based piece. Part of me thinks that's ok, because it's not meant to tell the entire story, it's supposed to be sort of a highlights-type piece. But it still just didn't rub me the right way. Ok, and on to the singing. I read that in other productions of this piece, the ballet companies hired singers to perform the songs. The SF Ballet decided to be crazy and use dancers from their own company. Now, dancers are not hired into ballet companies because of their singing voices. In traditional West Side Story productions, directors are more likely to cast singers who can dance than they are dancers who can sing. Why? Because it is a vocally challenging show. Those songs are not easy. And if they're sung badly, it can sound like a little kid singing in the shower. Which is exactly what last night was like. For most of the songs, the dancers who were dancing didn't even sing! There were two dancers (male and female) who stood on the side of the stage and sung the main songs! I don't know...I guess the novelty of "look! our dancers are SINGING!" just didn't appeal to me. I've seen too many really great dancers who are also really great singers to be excited by really great dancers who are mediocre singers at best. Sorry, SF Ballet, but this just didn't work. Also, there was a certain cheese-factor to the whole thing, especially when it came to the ending. Tony didn't die (which, um, kind of a big deal, right?) and instead danced a dream ballet (oh the dream ballet) with Maria and various ensemble members from both the Shark and Jet sides. I've seen many a cheesy dream ballet in my day, but this one takes the cake. There was skipping. There was hand-holding. There was swaying. There was facing the audience to suddenly sing "there's a place for us" en masse. The only redeeming part was at the end, after the dancers warbled there "somehow, someday, somewhere," the orchestra played those final haunting Bernstein chords and the dancers raised their arms slowly and lowered them, which I thought was kind of pretty. They did look a little crucifix-like for a second, and I hope that wasn't intentional, but overall, it made the ending not so miserable. Which isn't saying much. Needless to say, I didn't enjoy the West Side Story Suite as much as I had hoped to. Maybe if I had read up on it more first, I wouldn't have had such high expectations...but it was just so presentational and not engaging at all. I would have liked it so much better without the singing, even if it did feel sort of like a dance recital. With really, really good dancers. Oh, and they had Anita in a dress very similar to the original purple one from the musical/movie, which was nice. And, um, that's all I have to say about that. This review from the SF Gate seems to like the singing more than I did (and says the singer for "Somewhere" was hired? WHAT? )...but I have fairly high standards when I'm seeing a professional show. Check out Shonelle's review here. All in all, not a bad night at the ballet. Honestly, I would have paid $25 just to see In the Night. omg, do you mind if i bite your blog, and steal the photos to pimp my own reviews? they look so pretty. 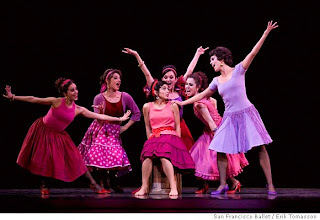 where can i find a photo of the cheesy pink men's West Side Story costumes? i might need to pick your brain first about how to get pictures to go by the different paragraphs, because i'm kind of challenged that way. i love your multi-media blog. Balancing pragmatism and spontaneity, and doing the best I can with what I have. I'm a Bay Area transplant from Los Angeles. I want to do All The Things. All text and images, unless otherwise attributed, are the sole property of Kim Rohrer. Awesome Inc. theme. Theme images by Ollustrator. Powered by Blogger.